There was a lot of transit talk at this week’s city council meeting. Presented to council were some 3D renderings of what the future Moore Square Bus Station could look like after its upcoming upgrade. Technology upgrades in downtown transit are also coming as money has shown up towards setting up a downtown Raleigh smartphone application and a smart card fare system for the CAT buses. Watch the video snippet above. If it doesn’t work for you, go here. 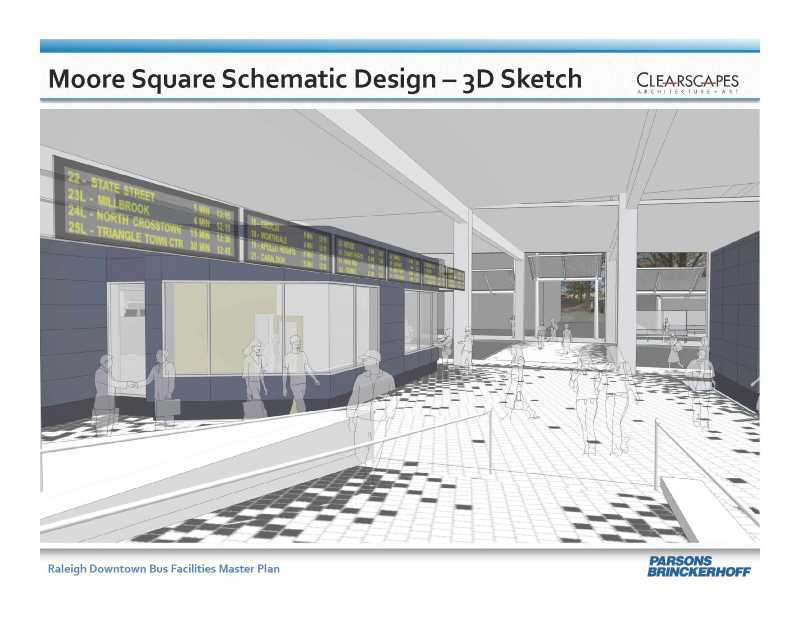 the design team presented some new renderings of the station’s future. 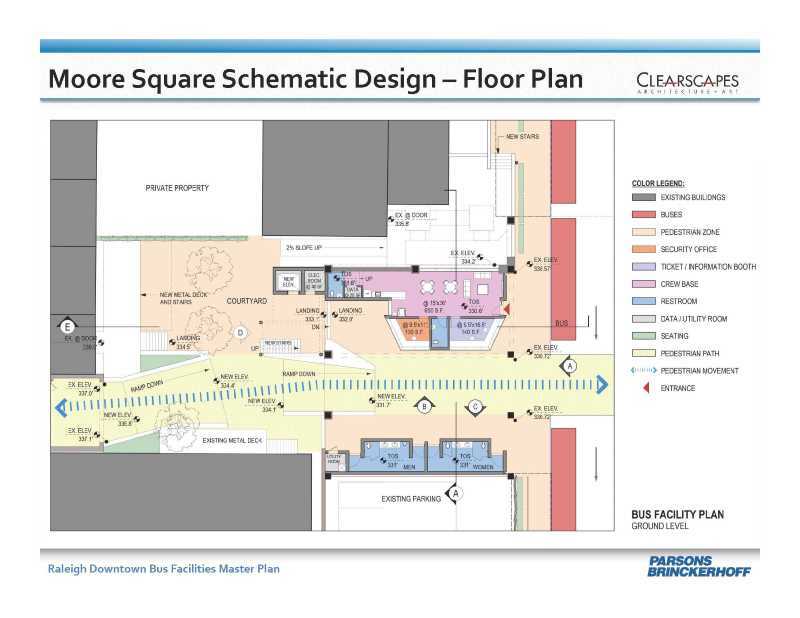 Construction could start as early as Spring 2015 on the now 26-year-old facility. Plans call for a new bathroom, security and ticketing office, more open, friendlier spaces, and and an additional lane for buses to handle more capacity. Construction is estimated to take 14-18 months with the station being open throughout that time period. Here are a few slides from the presentation. 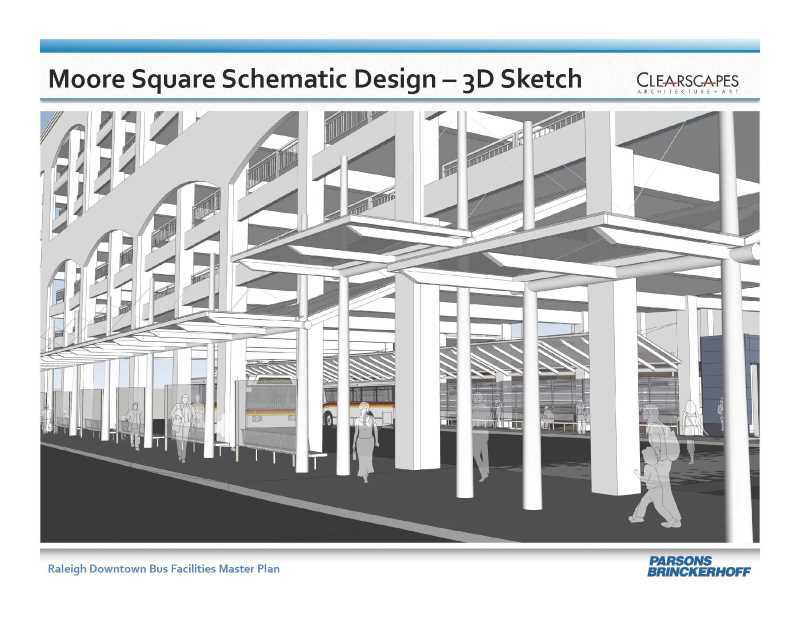 Make sure to read the Raleigh Public Record’s article about the presentation and to see the rest of the slides and renderings. We definitely talk about parking a lot here. However, an initiative that I’m involved with to bring a smartphone app to downtown in order to help with any parking struggles has moved one step further. During the meeting, council approved $5,000 from a contingency fund to go towards the development of that app. The Downtown Raleigh Alliance will raise the rest of the money and see the app to completion. The Raleigh Transit Authority has adopted a priority of offering smartcard technology on CAT buses. The grant will allow a contactless, smartcard payment option to be installed on the fare boxes of the CAT bus fleet. Bus purchases will have fare boxes that will accommodate contactless smartcard and mobile ticketing applications. The total funding for the project is $378,440 90, which is 90 percent NCDOT grant funds and 10 percent City of Raleigh funds. I’m not sure how I feel about the design behind the Moore Square over-hall, but coming from someone who’s used that bus station every day for a year now, the added seating and expanded awning is a welcome sight. Also, moving the information and ticketing booth underneath the parking deck is huge. I can’t count how many times I’ve seen a line of people standing in the rain because the current info booth has barely any awning. Good ideas all around. The rain usually washes away the trash and urine. I doubt they will change the cleaning of the elevators in the deck or around the site which requires full time police. What a waste of 7 million dollars just let the rates stay at $1 which goes to 1.25 then 1.50 but they will have a awning over them. Money would be better served on light rail. BC – gotta up our bus game before we jump into light rail. Bus system blows in this city, let’s get one form of public transit top notch first. I’m happy to see a step towards utilizing smart card technology in Raleigh. I agree with Jake, in that we have to up our bus game. Light rail will come, eventually. We must stop with greater attention to implementing walkable urbanism in places other than Downtown, Hillsborough Street, and Cameron Village. I bet Mike Rowe will do a Dirty Jobs episode for the guy who has the responsibility of cleaning the transit station bathrooms.